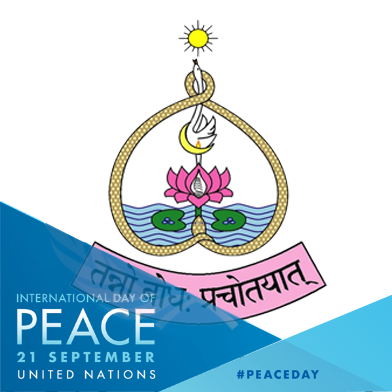 International Day of Peace was celebrated by IVPT at a function held at the Isa Viswa Vidyalayam on September 21, 2018. His Holiness Jagadguru Swami Isa gave a discourse called "Peace Is Not Outside, But Inside." He highlighted the need today to focus on the positive, in order to create the world we all want to live in. He said, “Peace is not outside but inside. All problems start from thoughts. Thought becomes emotion, and action is according to that. When thought is changing, everything is going to change. World peace exists inside the human mind. Mind your thoughts. Make your thoughts good and transparent. You can smile, you can share peace, and when you become peace, the world also becomes peace. Swami isa further said, “Human world means human individuals. Human change means human thought change. Think about your thought. When your thought becomes bright, you become bright. When your thought becomes dark, you also become dark. Brightness leads to a better, beautiful world. If you expect that, keep your mind always bright and beautiful. That mind always loves everything. You want to become love, you want to share love, the entire universe. Your thought and your way should always bright. Students and teachers spoke about the importance of having a peaceful mind in creating a peaceful world. They gave creative role-play demonstrations about the effects of one's houghts on one's environment and one's actions. They thanked their teachers and Swamiji for the opportunity to learn in the Education for Total Consciousness format which promotes this idea of the outer world linking to inner world.